Dairy Intolerance: What It Is And How To Determine If You Have It written by Mark Sisson and originally published at MarksDailyApple.com, is syndicated with exclusive permission for Healthy Living How To. Most lactose intolerance develops because people stop producing lactase after weaning. No more breast milk, no more need to expend the energy necessary to produce lactase. This is usually genetically determined, and people with milk-drinking ancestry are far more likely to possess the gene(s) for lactase persistence (it takes just one copy to keep making lactase into adulthood). 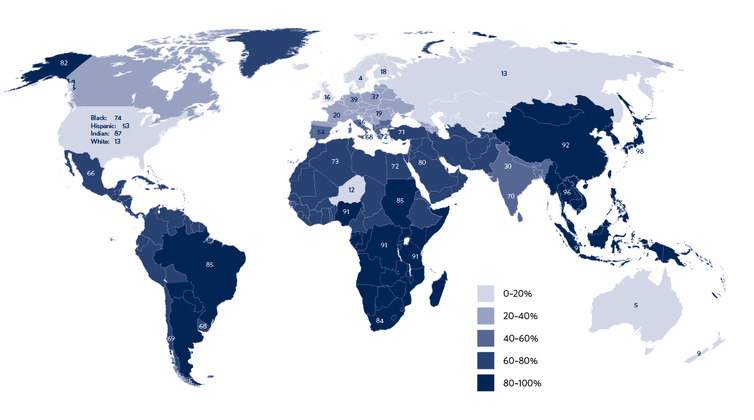 About 75% of the world’s population shows decreased lactase production into adulthood, but distribution varies wildly by ethnicity and nation. Looking at this global map is probably a better way to understand the prevalence of lactose intolerance than throwing out a single number. Among Northern Europeans, who have a long history of dairy consumption, prevalence is around 5%. In most of Sub Saharan Africa, where dairy is rarely consumed, lactose intolerance nears or surpasses 90% prevalence. The medical profession uses two main tests for determining lactose intolerance. Both involve the test subject consuming a lactose-rich drink. The hydrogen breath test measures the amount of hydrogen in your breath. If you’re unable to digest lactose, any lactose you consume will make it to the colon to be digested by hydrogen-producing bacteria; this hydrogen will show up in your breath. Another option is the blood glucose test. If your glucose doesn’t go up after eating lactose, you’re not cleaving it into digestible monosaccharides and you are probably lactose intolerant. A dairy protein (whey or, more commonly, casein) intolerance is different than a full-blown allergy. In an allergy, consumption of the offending food elicits an immediate, acute, unmistakable immune response. You might get severely plugged sinuses, itchy skin, hives or rashes, hypotension, diarrhea, vomiting, an elevated heart rate, and have difficulty breathing. Tests can confirm it but you’ll probably already know you’re allergic. If a swig of milk causes anaphylaxis, you don’t need a post telling you to drop it for 30 days and reintroduce it. You’re already in the know. Intolerances to the proteins in dairy are a bit more confusing. Some of the symptoms are similar to, if milder than those of allergic reactions. For some people, it manifests as constipation. For others, diarrhea. Still others get tingly fingers, joint pain, and a foggy head. Whatever the symptoms of a dairy protein intolerance, they usually take longer to appear, making identification difficult. Plus, little scientific consensus exists on the nature of dairy protein intolerance. There are no universally accepted lab tests and few medical professionals will be able to help. Casein seems to be the most common dairy protein people are sensitive to; it’s far more rare for whey to be an issue. According to population-based studies, the prevalence of cow’s milk protein allergy ranges from 0.25 to 4.9% of young children. It’s less prevalent among adults and older kids. Official numbers for milk protein intolerance prevalence are unknown because the condition itself is relatively unknown in the medical community. You can do skin prick tests or shell out the dough for expensive food sensitivity lab results (that may not even tell you anything definitive), but the gold standard remains the food challenge: strict avoidance of the suspected food until symptoms subside followed by an oral challenge. A major, and in my opinion likely, candidate for the cause of dairy protein intolerance is intestinal permeability, or leaky gut. An overly permeable intestine (all intestines are permeable to a certain degree; it’s excessive permeability that’s the main issue) allows protein fragments from the digestive tract into the bloodstream. When the immune system identifies these errant proteins as invaders, it does what it does in response to any other invading pathogen: mount an attack and fortify the body’s defenses by releasing histamine (which tries to get rid of the “pathogen” by inducing diarrhea, sneezing, runny nose, watery eyes, and all the other symptoms you might get from an allergic or intolerance reaction). In a perfect world, casein may not be inflammatory in and of itself, but its presence in the bloodstream can invite an inflammatory response. Click +1 Below. Do you do dairy?